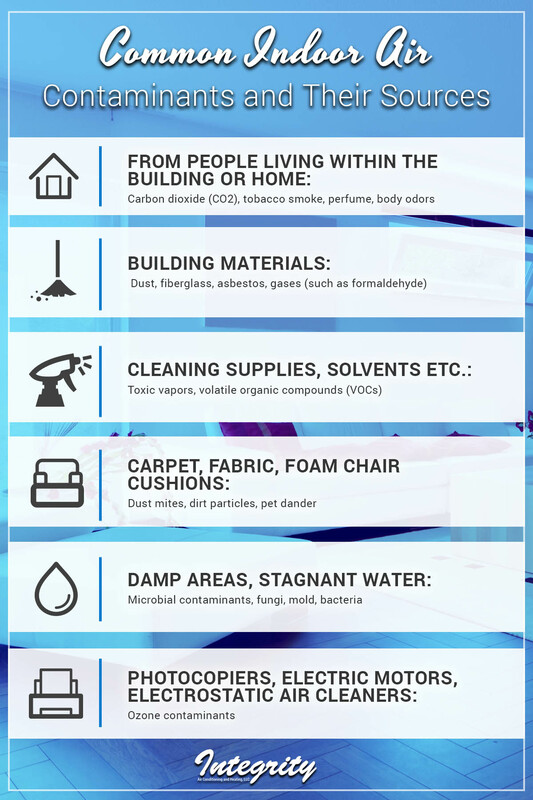 How Does Indoor Air Quality Affect You? How much thought do you give to the quality of the air within your home? If you’re like many people, it might not cross your mind unless you can actually see smoke wafting around the ceiling. While the saying goes “where there’s smoke, there’s fire”, there isn’t always a clear sign of poor indoor air quality. However, indoor air quality has become an increasingly important health and safety concern in recent years as we learn more about how it affects us. Today we’ll be looking closer at what causes poor air quality, some of the contaminants you might find in your air, health problems that can arise, and some ways that you can improve your home’s air quality. Poor air quality can stem from issues in your HVAC system. To schedule an inspection of your system, call Integrity AC and Heating today. Depending on the contaminants in the air, it can cause people to develop allergies, asthma, and other respiratory illnesses. Regularly vacuuming with a HEPA filter and mopping helps clear lingering dust and other particles. Keep the humidity in your home around 30-50 percent to control dust mites, mold, and other allergens under control. Cigarette smoke contains over 4,000 chemicals, so make your home a no-smoking zone to avoid the dangers of secondhand cigarette smoke. A colorless, odorless gas that is the second leading cause of lung cancer in the U.S. Get your home tested by a professional. Synthetic fragrances may smell nice, but they add a bunch of unhealthy chemicals into the air you’re breathing. Avoid laundry products with added fragrances and aerosol sprays. Poor indoor air quality has a greater effect on your family’s health than you might think. Another way that you can improve your home’s air quality is by using a HEPA filter in your HVAC system. If you would like to learn more about how your HVAC system impacts air quality, or you would just like to make sure your system is working properly, call Integrity AC and Heating in Phoenix today to schedule an appointment. We hope to hear from you soon!